Do you like cooking for the holidays? Do you make sweet treats? 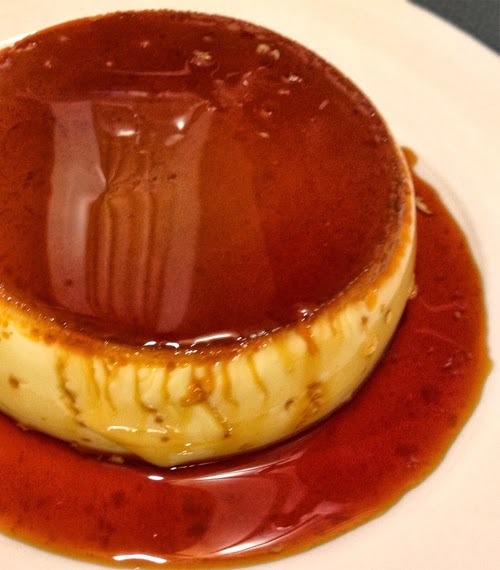 Then check out this easy flan recipe I learned from my mom who learned it from her mom, and so on. It's unfortunate that my aunt, who is diabetic, is not able to eat this. But it's tradition. Heat sugar in a saucepan at medium heat. Stir frequently so that it doesn't burn. Once the mixture becomes golden clear, pour it into a pie dish. Turn the dish frequently to evenly coat the bottom. In a bowl, whisk the eggs, condensed and evaporated milks and vanilla. Pour mixture into the pie dish with caramelized sugar. Bake in oven for 60 minutes. Remove from oven and cool for 15-20 minutes. By now, it is ready for serving and can be devoured right off the pie dish. But for presentation, pop them out of the pie dish by placing a serving plate upside down on top of the pie dish and inverting the flan onto the plate. This way, your guests will catch an eyeful of the delicious carmelized sugar layer. This step is made easier by using a non-stick pie pan. See them here on Amazon. I prefer mine a little chilled, so I cool it in the fridge for 2 hours before serving. Traditionally, we make flans the night before a party and leave them in the fridge till the next day. Keep in mind that a healthier version can always be made by using low fat evaporated milk and low fat condensed milk instead. Here is a great video that essentially demonstrates the process of making egg-based flans. I'm using more eggs in my recipe. And I'd probably skip the salt altogether, but the lime zest is very tempting and may have to be incorporated in my normal flan routine. It's a short video. Check it out. For non-sugary snacks, well, baked potato slices are good.